How about drying methods Nick. Would there be any disadvantage to drying with a jelly blade / squeegee type method? I'm wondering if the rubber blade dragging over the newly coated surface would have any effect. It is recommended to dry with a quality microfiber towel, like Meguiar's Water Magnet. This plays an important part in the application of this product & other drying methods, like a rubber blade, or even air drying, to my knowledge at this time, are not recommended. Was using Hybrid Ceramic Wax yesterday on my black 06 LS430. A couple notes for when some of you do start to get your hands on this product, it is very easy to be tempted to spray a lot of product, ensuring even coverage across every inch of paint. This is not needed, but again, it's very easy to feel like it is needed. The product is spread across the paint with the rinsing of the water, so applying a heavy application is not necessary. I will have a detailed thread soon on application. This product makes drying of the vehicle exceptionally easy, and I was not even using D.I. water. When will this be available for purchase? And what kind of businesses will carry it? According to our R&D department, Hybrid Ceramic Wax can last up to a year. Now I'm confused. Utimate Fast Finish and Ultimate Wax are are supposed to last that long. So can this product be used in place of those? And you only use it once a year even if you wash every week/month? And I already use Meguiar's Ultimate Wash and Wax. What does this add to that? 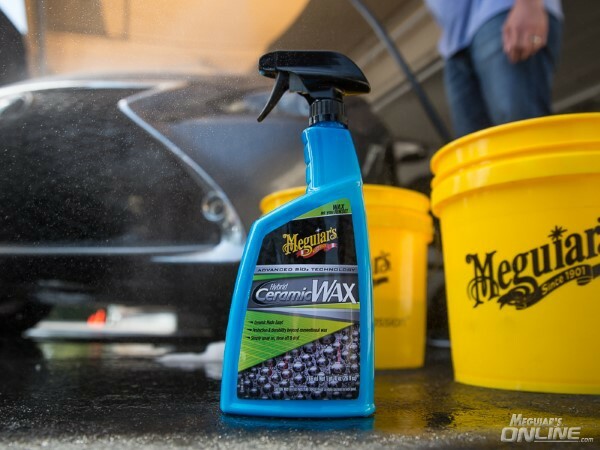 How about making a product like UW&W with the Hybrid Ceramic Wax so no need for a separate step of spraying it on after washing and rinsing a second time? Or could I just mix the two together? Am so excited for this product! In the US you will start to see it available online mid December or earlier. Retail stores will be more towards March or later. Hopefully the following can help you out! The main rationale for this product is to give a user the ability to get long lasting protection on their car extremely quick & easy. Ultimate Fast Finish shares the same rationale, but is a different application method & different base chemistry. Also, we have never claimed Ultimate Liquid or Paste Wax to have the potential to last a year. Hybrid Ceramic Wax can be used as your main source of protection or in other words, in place of a wax/sealant. It can also be used in addition to your favorite wax/sealant. To answer your question regarding why not make a car wash soap with this, I am not involved in all the details regarding why we choose a particular format or not, so tough to answer. I am happy to pass along your feedback though. Also, definitely would not just "mix the two together", your likely not going to get anywhere near the benefits since it is not designed to be used that way. In other words, it not that simple.